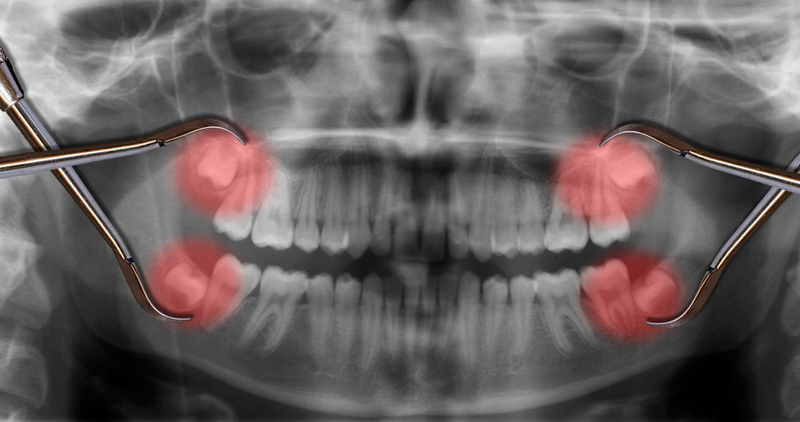 Wisdom teeth, or third molars, are the last permanent teeth to erupt, usually during the late teens or early twenties. Since they develop much later compared to other permanent teeth, they have the tendency to cause multiple dental problems which can make wisdom teeth removal a necessity. Extracting one, two, or all four of the troublesome third molars can help resolve the problems you’re experiencing now and prevent future problems. Sometimes, the wisdom teeth don’t come through the gum properly. This may happen because the jaw is too small, such that there isn’t enough space for the tooth to develop properly. Alternatively, the tooth may develop in the wrong direction. When a wisdom tooth doesn’t erupt properly, it is known as an impacted wisdom tooth. Wisdom teeth may also be considered troublesome if they push adjacent teeth out of alignment causing crowding or if they interfere with orthodontic treatment or other dental work. Moreover, they’re generally hard to clean, considering they’re at the back of the mouth, which may add to any dental/gum problems. If you’re struggling with any of the above problems, Dr. Jeffrey Stein in Lancaster, Palmdale will perform a thorough dental exam to determine whether you’re a good candidate for wisdom tooth removal. This exam includes a review of your dental and medical history, physical examination of all your teeth and gums, check for signs of infection, and x-rays of your teeth and jaws. Wisdom teeth removal is an outpatient surgical procedure. Dr. Stein may recommend the removal of all 4 teeth at once, or in separate procedures for each side of your mouth. Each session lasts anywhere between 45 minutes and 2 hours, including recovery from anesthesia. Please visit Dr. Stein in Lancaster for a thorough examination of your troublesome wisdom teeth and a personalized treatment plan that may involve removal. This entry was posted in Lancaster Dentist, Palmdale Dentist and tagged wisdom teeth removal. Bookmark the permalink.